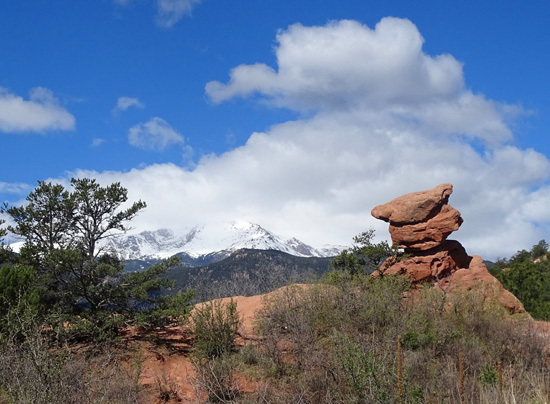 sculpted through time by erosion." 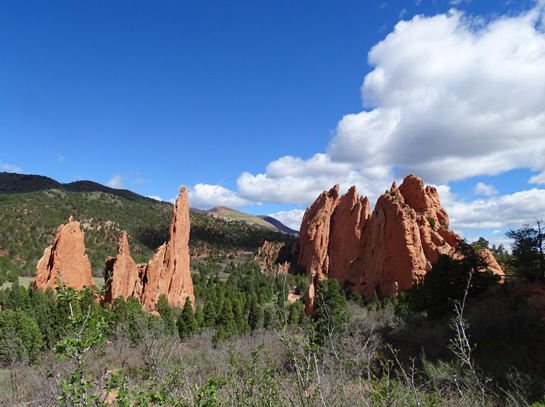 We can thank a railroad executive for this beautiful, free park. 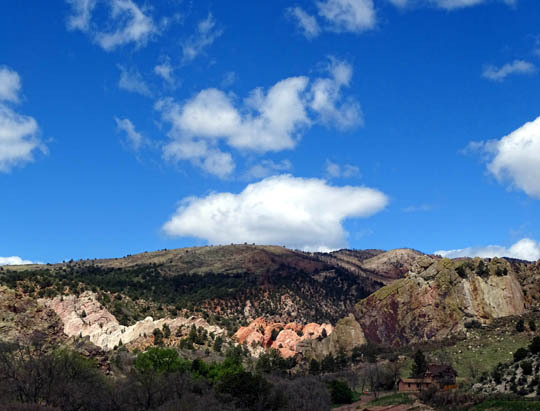 It's one of our favorite places to visit in the Colorado Springs area. 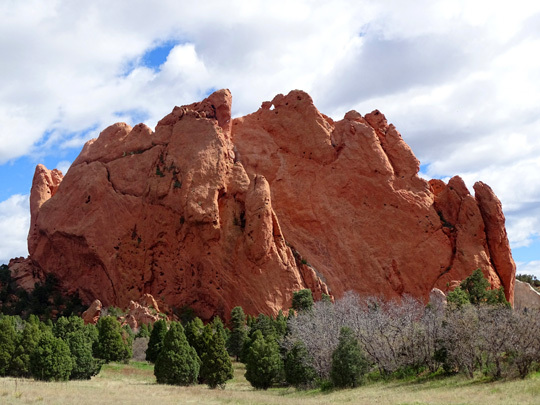 In 1879 Charles Perkins, president of the Chicago Burlington Quincy RR, purchased much of the land that is known as the Garden of the Gods. 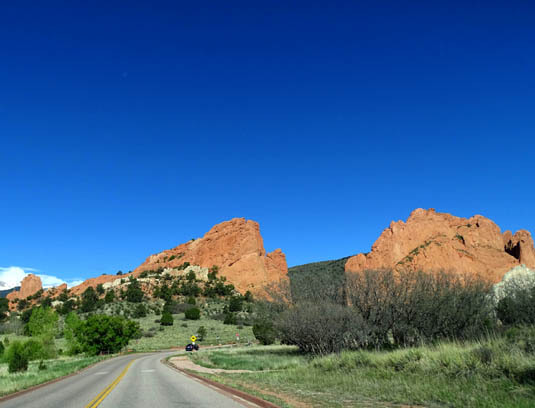 When he died, at his request, he gave the land to the city of Colorado Springs to be used as a park. 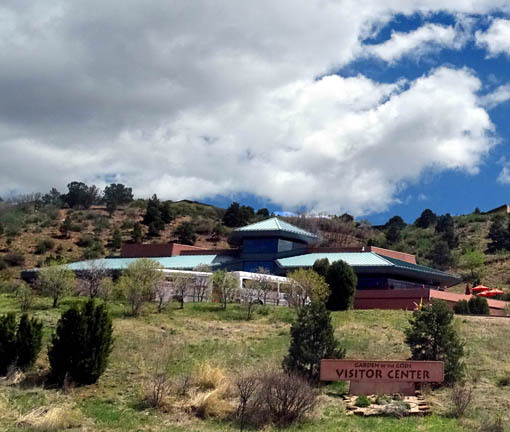 The stipulations included the name and that it would remain free to all visitors. 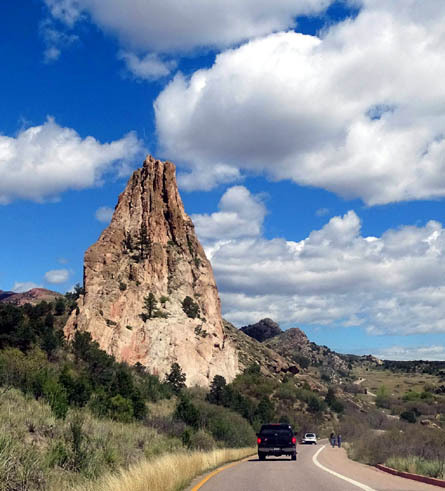 This is a great spot for a scenic drive, hike, bike ride, or horse ride. 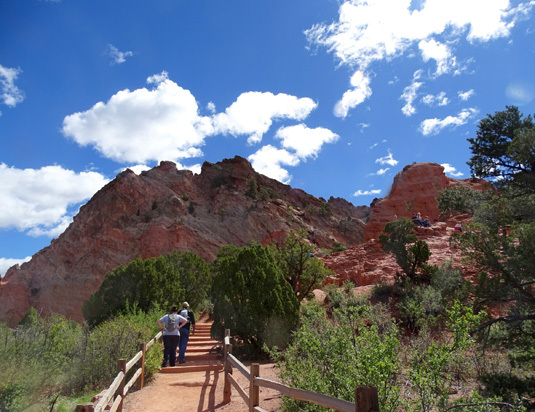 All of the trails are open to pedestrians. 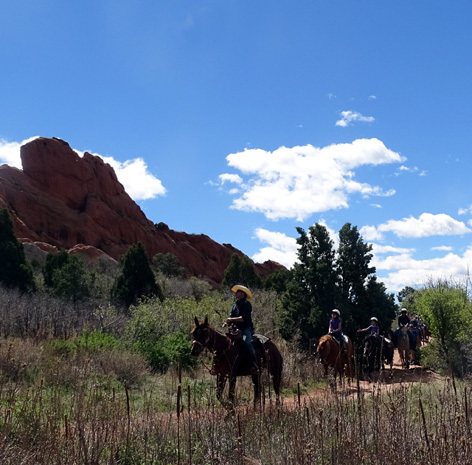 Some of them in the south end of the park are also open to cyclists and equestrians. I had to get Casey well off the trail when I saw these horses coming. Cody just ignores them but Casey gets all excited. 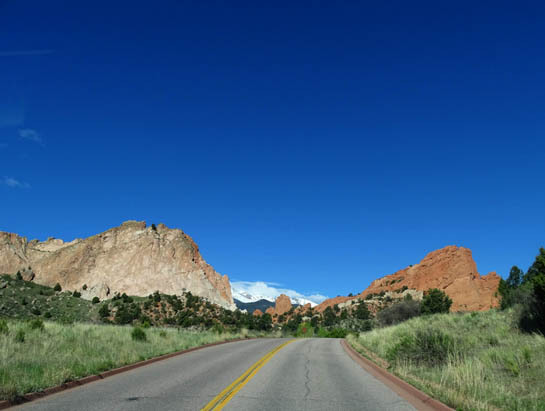 My first visit to the park was back in the 1980s when I ran a 10-mile road race through the winding, hilly roads in the park during a national RRCA (Road Running Club of America) convention held in the Springs. It was one of the Top Ten road races back in those days. 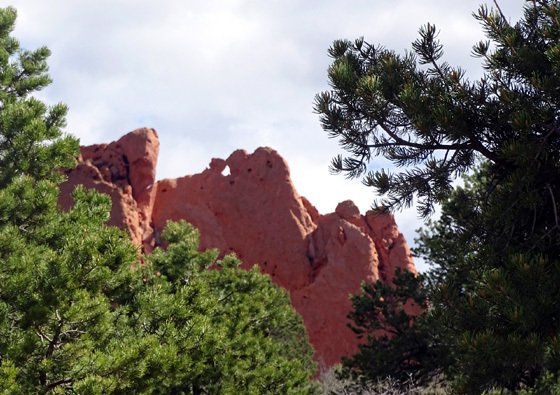 Jim and I have visited Garden of the Gods many times in the last decade when we've camped at the USAF Academy. 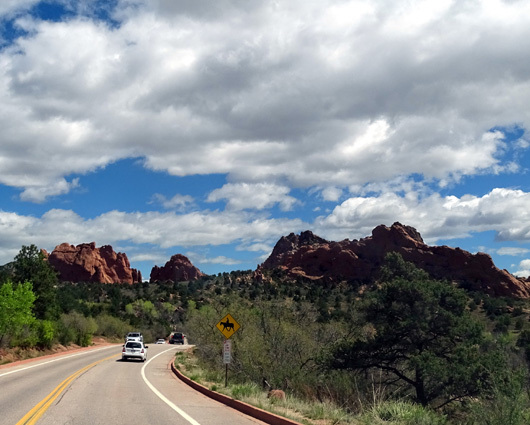 There are miles and miles of winding, hilly dirt and rock trails, too. 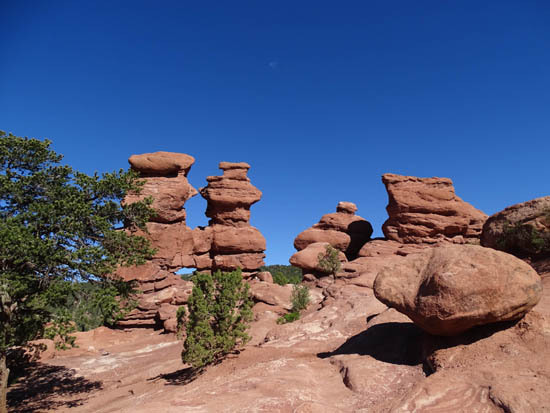 the park also offers a great scenic drive at any time of the year and there is a flatter, paved path through the Central Garden (of rock formations) that is wheelchair accessible. 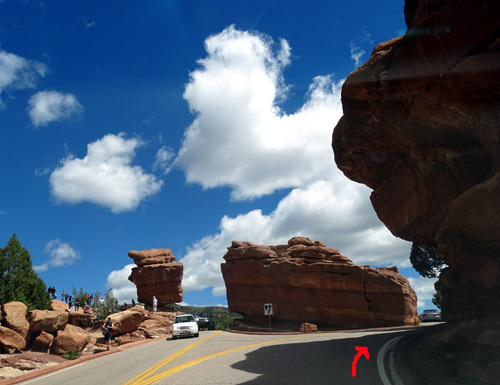 Balanced Rock (visible on the left) -- there is a very narrow one-way lane through the rocks. 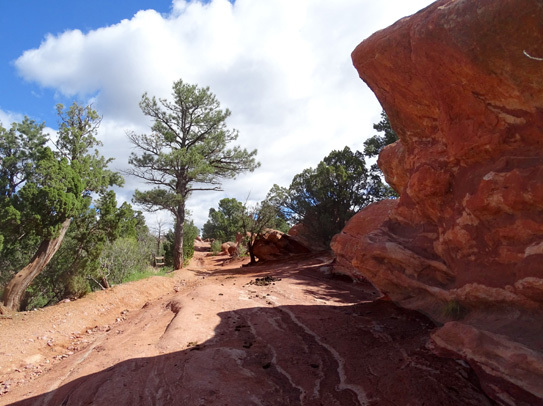 Some roads within the park are one way; this is part of the Juniper Way Loop. 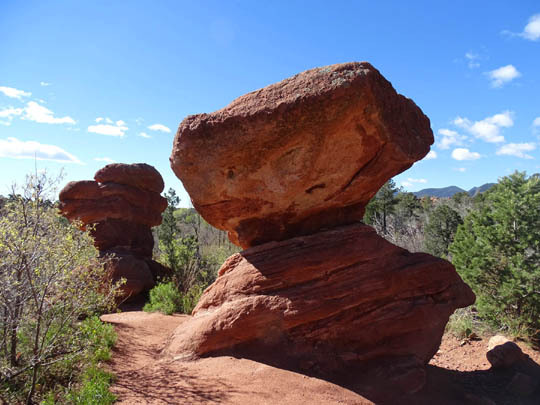 These interesting rock formations are just north of the park on 30th Street. 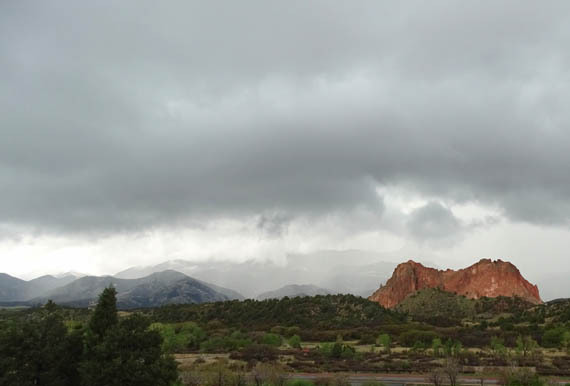 Our first visit to Garden of the Gods this time in early May was brief because a big storm was brewing over nearby Pike's Peak and the surrounding foothills. 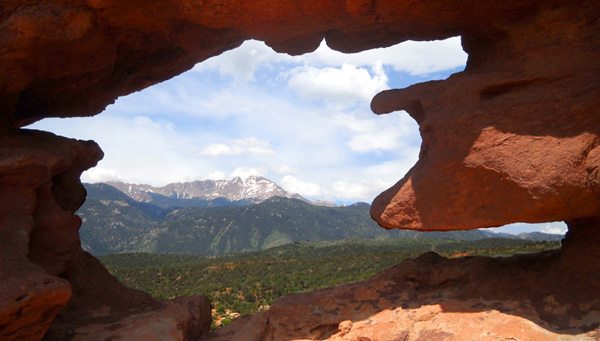 We couldn't even see Pike's Peak that day. 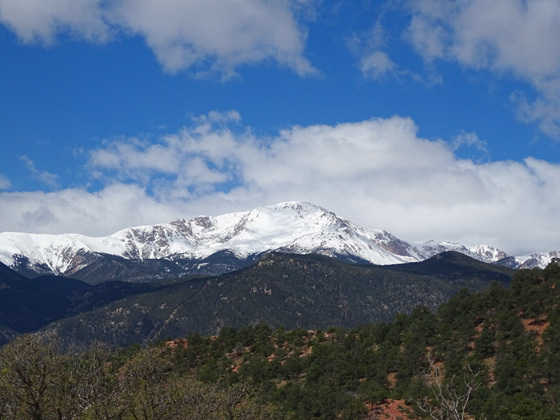 This is a great spot to view the mountain on a clear day but we didn't go back to the visitor center again on this trip. 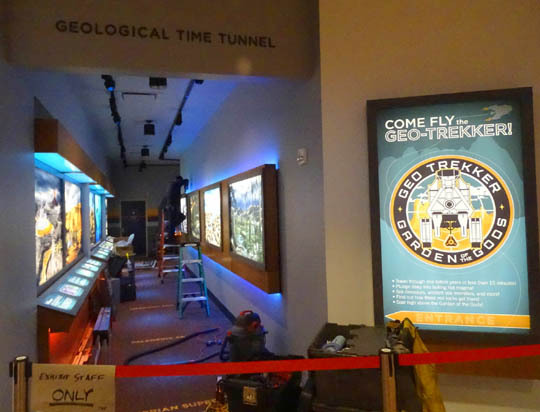 The new "Geological Time Tunnel" exhibit was still under construction in early May. 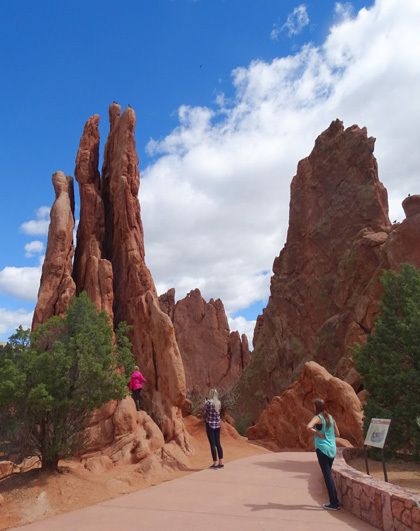 The best way to view the unusual rock formations in Garden of the Gods is to get up close on a walk (or bike or horse ride). We did that twice this time. 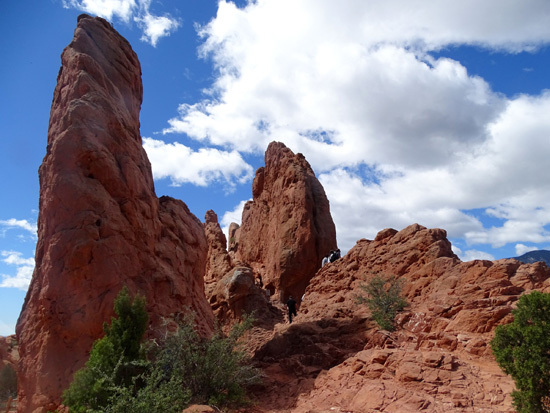 Following are some of the photos I took in the Central Garden, where the paths are paved and relatively flat, and other trails that are more hilly and rough -- Siamese Twins, Foothills, Ridge, Scotsman, Buckskin Charlie, Chambers/Palmer, and Springs Canyon Trails. Central Garden area has the most people. 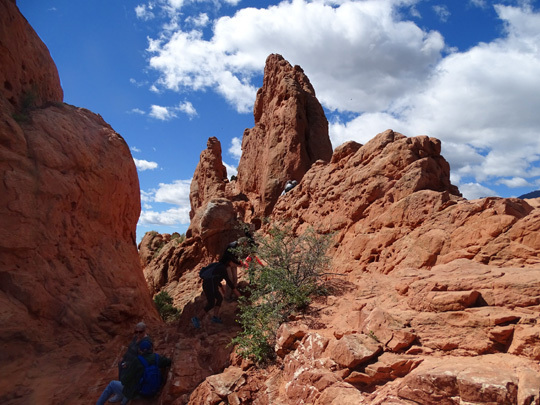 Fewer folks hike the rougher, hillier dirt trails. 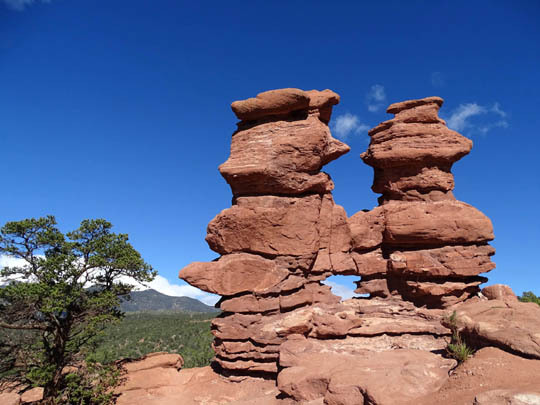 There are other formations with descriptive names like Cathedral Spires, Sentinel Spires, Toadstools, Giant Footprints, Pulpit Rick, Three Graces, Balanced Rock, Tower of Babel, and Siamese Twins. 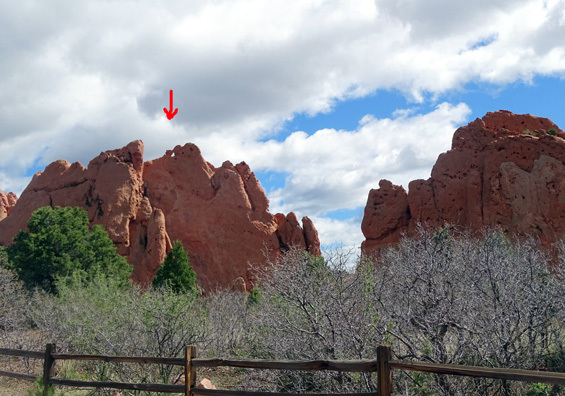 I love the "window" or "keyhole" in the middle of the hoodoos. 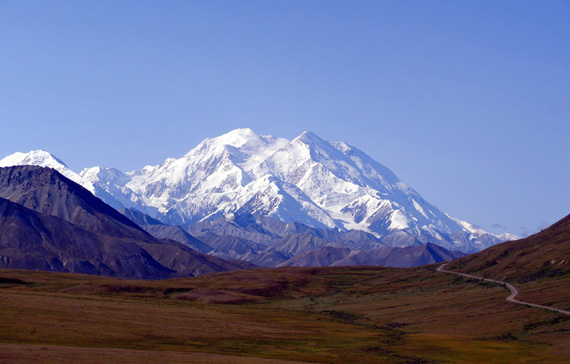 It's best when there are no clouds appearing at the summit of the mountain. You can see the famous "Incline" where the trees were cut in the close up below, near the bottom left. 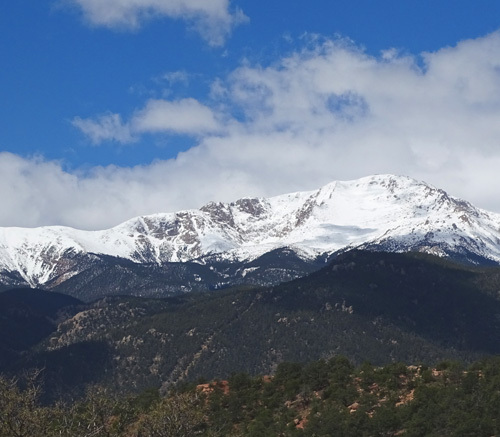 That photo shows the east side of Pike's Peak and the mountains in front of it. 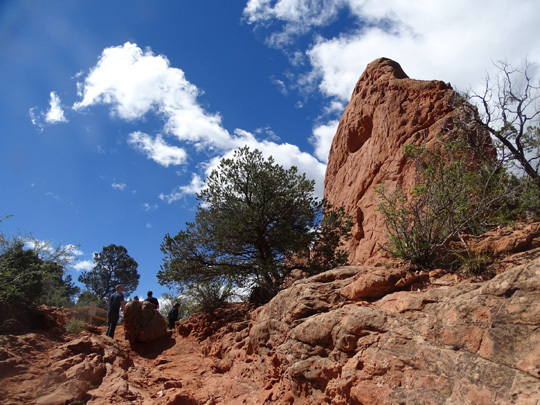 The most popular trail to the summit goes up this side from Manitou Springs, rising from about 7,000 to 14,000+ feet elevation. 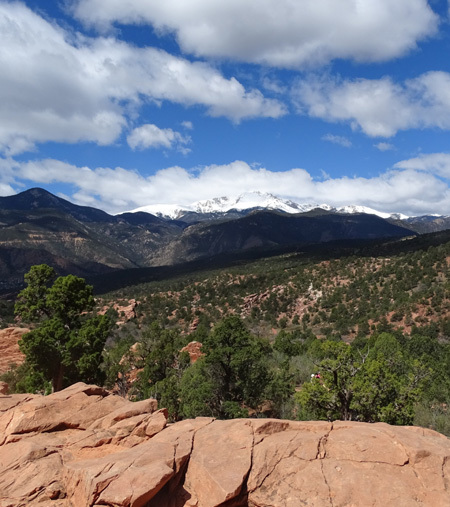 I've run/hiked it several times before but there was too much rain and snow this time. 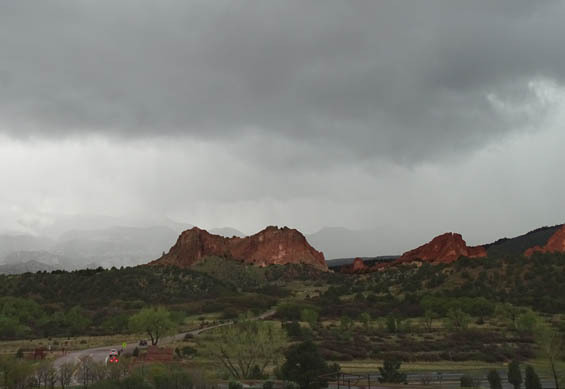 In addition to trails, nature walks, and the visitor center, Garden of the Gods also has picnic areas, a trading post with restaurant, and the Rock Ledge Ranch Historic Site. Here's the official website. 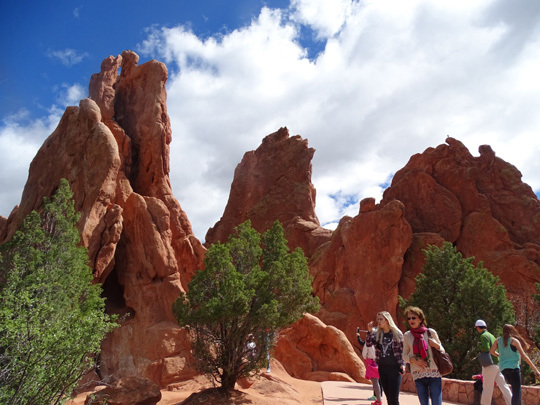 It's a great place for kids of all ages (even us Olde Pharts) and most everything is free. You can spend an hour or several days there. 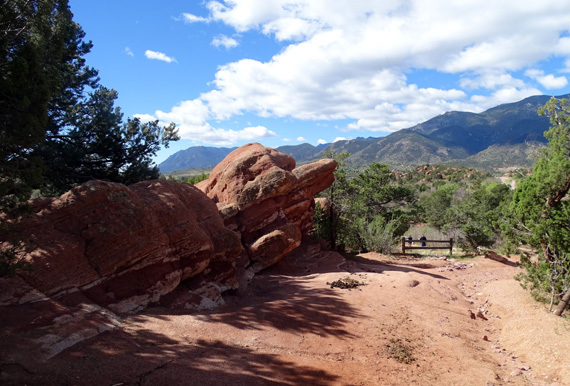 Another free city park with great trails and interesting rock formations in the Springs is Red Rocks. 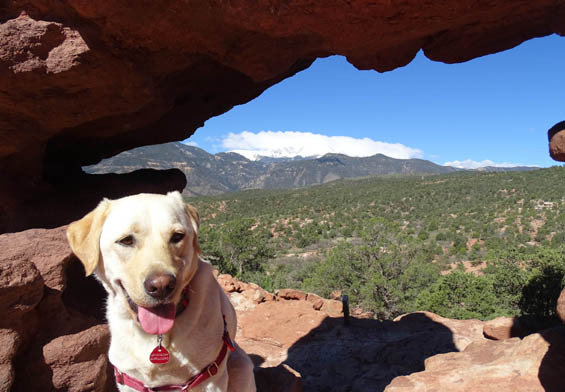 Unfortunately it was closed most of May due to mudslides and trail erosion. There aren't any roads through this park so you have to get out and walk, or ride a mountain bike or horse on designated trails.